Ever wondered how much pastry you need to make a pie, or a pasty, quiche or whenever you need to use shortcrust pastry? Probably quite often. After all, telling me I need so many grams of flour doesn't give much away, does it? 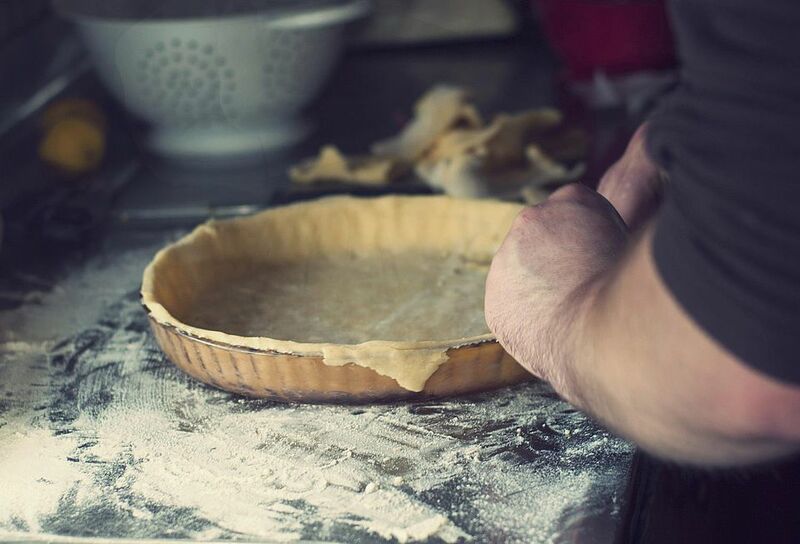 Though making shortcrust pastry is quick, straightforward and easy, working out how much you need to cover a pie or line a tart tin can be confusing. So, how do you work out what you need? How Do I Work out How Much Pastry I Need? If a recipe calls for a certain quantity of pastry, this usually means the weight of flour and fat, plus any water you have added, what that does not tell you is just how much that quantity will create, how can it? Only you know what you are making. You can quickly work it out by keeping a record every time you make the pastry, record what you make with it, how thinly it was rolled and how many pies tarts, pasties, etc. you made. Or easier, use this simple calculator below, where it has been roughly worked out for you. Here's a quick guide to help estimate how much to use. 300g flour (10 oz) = 450g (14½ oz)) pastry, this will cover a 1.5 - 2 liter (2½- 3½ pint/) dish, or line and cover a 23cm (9") pie. 400g flour (13 oz) = 600g (1¼lb) pastry, this will cover a 2.5 litre (4 pint) dish, or line and cover a 30cm (12") pie. Do not worry. Simply roll up scraps of pastry and use them to make jam tarts, so quick, simple and delicious to eat. If you have more than scraps, then freeze the pastry. Wrap it in plastic wrap and pop it in the freezer for later. Simple. You can add it to more pastry next time. How Much Tuna Can You Safely Eat?